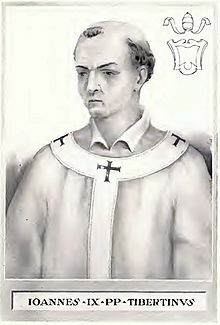 John IX (Latin: Ioannes Nonus) was Pope from 898 to 900. Although his exact birth day is unknown, he was a native of Tivoli, which is near Rome. He was a Benedictine monk. He was made Pope because of the support of Emperor Lambert of Spoleto. Lambert was of the Formosian party. Pope Sergius III who had been elected by the Anti-Formosians was chased from office with arms. John IX died unexpectedly in the year 900, which again led to feuds between different groups. Pope John IX Facts for Kids. Kiddle Encyclopedia.